This is a gorgeous embossed glittery fabric! It is a deep rich color that has glitter dots throughout. 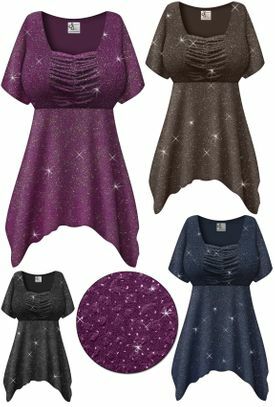 This stretchy slinky babydoll top is available in plus & supersizes from 0x to 8x! It has short sleeves, a square-ish neckline and extra roomy hips! It is approximately 32"-35" long in the center and 4"-6" longer on the sides! The sleeves are about 9 inches long. The style is very flattering! The slinky fabric is wonderful & a breeze to take care of! Throw it in the washer, dryer, and straight into a drawer or suitcase, take it out days or weeks later, and its ready to wear! As with all the slinkies, they rarely wrinkle, are very stretchy, and hang great!